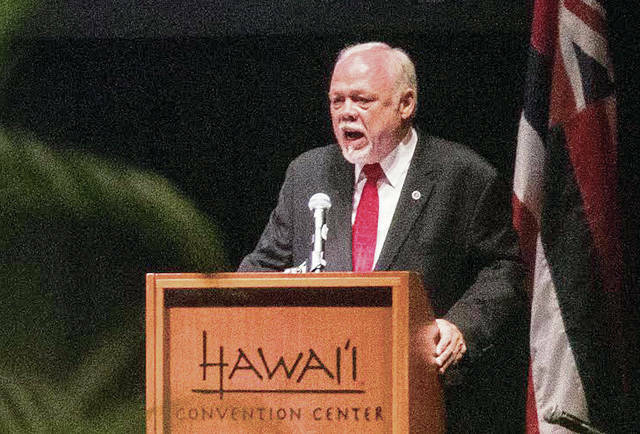 Don Benton, President Trump’s Selective Service director, has been accused of violating the Hatch Act during a speech he gave at the Hawaii Republican Party’s Constitution Day Dinner on Friday. However, the local party chairwoman said the fault lies with party members who produced the event, not Benton. The Campaign Legal Center, a nonpartisan watchdog organization based in Washington, D.C., filed a complaint with the U.S. Office of Special Counsel on Tuesday calling for an investigation of Benton following a story about the event that ran in the Honolulu Star-Advertiser on Sunday. The federal ethics law bars executive branch employees from using their offices and resources for political purposes. While officials can participate in political activities in their personal capacity, they are prohibited under the law from using their official title at political events and from using their office to influence the results of an election. On Friday, Benton spoke at a Hawaii Republican Party event at the Hawai‘i Convention Center in Honolulu. The fundraiser, where tickets went for $200 and VIP tables cost as much as $10,000, marked the launch of the Republican ticket for November’s general election. Benton’s title of selective service director flashed on a giant screen as he took the podium. By “using his official title while addressing this Hawaii Republican Party event, Mr. Benton violated the Hatch Act,” wrote Delaney Marsco, an attorney with the Campaign Legal Center in a letter to the U.S. Office of Special Counsel. Benton did say at the event that he was not speaking in his official capacity. Benton went on to tell stories about Trump during the 2016 presidential campaign and praised the president’s foreign policy agenda. Marsco said Benton’s disclaimer wasn’t sufficient to avoid a violation of the Hatch Act. “His insistence that he isn’t breaking the law doesn’t change the fact that he appears to have broken the law,” she said by email. Shirlene Ostrov, chair of the Hawaii Republican Party, however, said that the mistakes were made by local party volunteers, not Benton, who she said was there in his personal capacity. Matthew Tittman, a spokesman for the Selective Service System, said he was not aware of any specifics about the Hawaii Republican Party event when asked for comment. He said that Benton was in Hawaii for an official trip to promote Selective Service readiness and registration and had met with the governor and numerous community organizations. A number of other Trump administration officials have been accused of violating the Hatch Act. In March, the special counsel’s office found that White House advisor Kellyanne Conway had violated the Hatch Act for advocating for and against candidates in a special election held in Alabama last year. Last month, the Citizens for Responsibility and Ethics, another watchdog group based in Washington, D.C., filed complaints arguing that 10 Trump officials had violated the federal law, including White House press secretary Sarah Huckabee Sanders and Mick Mulvaney, director of the Office of Management and Budget. There are a wide range of disciplinary actions that can be taken if a federal employee is found to have violated the Hatch Act, ranging from reprimand or a civil penalty to being fired. The Office of Special Counsel can recommend a penalty, but it is ultimately left up to the president’s discretion.